It always makes me a bit sad to see the Virtual Cookie Exchange come to an end. The thought of waiting another year for a cookie party with you is so hard! projects, and beautiful Christmas quilts. I love hanging out with you! amazing blogger friends. I'm glad you're here for my party! P.S. I think this is one of my longest posts ever...sorry. Just skip to the end when you get bored. I'm lucky I have a totally normal family! When I was a child we spent Christmas Eve at my grandparent's house. We HAD to wait until my grandfather got off work before we could eat or open presents. that meant our waiting seemed like FOREVER, especially for a little kid like me. We were so tired and hungry by the time he got home! I'm the one up front with two of my older sisters in dresses my mom sewed for us. My mom started the tradition of Christmas morning breakfast and we've carried it on. Some of them don't bother to get out of their pajamas. Every year we had a party that included two of my favorite friends and their families. Lots of food, laughing, and memories. We'd have a special visitor sometimes, too. 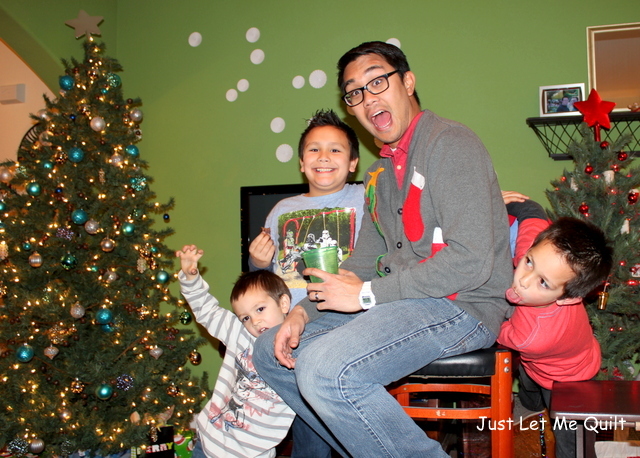 Our Christmas Eve parties are pretty much just my family now...with the Monkey Boys, of course. This is a much anticipated event with some serious competition involved. The number of gingerbread houses has grown quite a bit over the years! When my kids were little, Christmas baking was massive at our house. the delicious rewards of all the goodies she bakes. My family loves her baked cookies! rescue and said she'd whip them up for me. Yay! She even took photos...yes, she's a keeper. the walls, she tweaked the recipe and made cookies that were so delicious! They were Monkey Boy approved, too. This is my newest 2018 Christmas quilt...I love that Grinch guy! Thanks for scrolling through my Christmas stuff! Two lucky winners will be chosen. Leave one short and sweet comment to enter both giveaways. The winners will be chosen using Random Number Generator. ENDED ~ Ends 12/1/2018 at midnight MST. It's an amazing gadget for holding your sewing tools. You can find it in their store HERE. Congratulations to Daryl who won the Stash 'n Store! 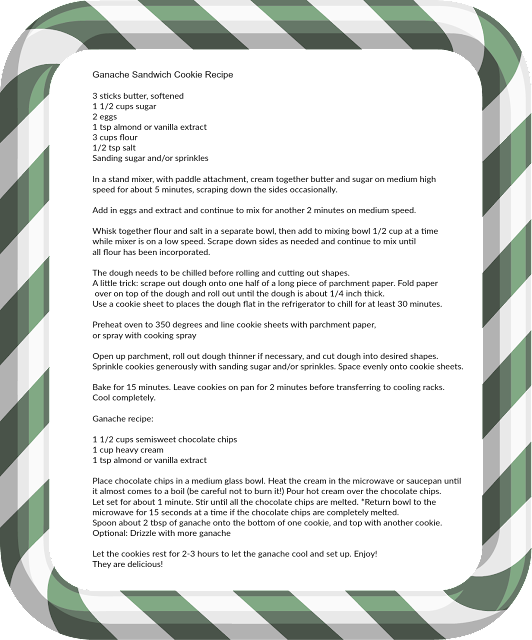 The second giveaway is a $20 gift certificate from me for Quilt Taffy's online store. Shopping at her store is so fun! Congratulations to H Clare who won the gift certificate! 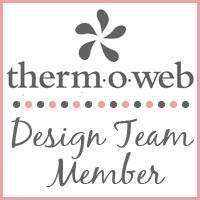 There's a Pinterest page for all the cookies and projects, too! I hope you've had fun seeing all the traditions, recipes, and Christmas quilts! The cookies look delicious, and your quilts are so cute! Love the look on the little guy's face. Thanks again for such a great hop! 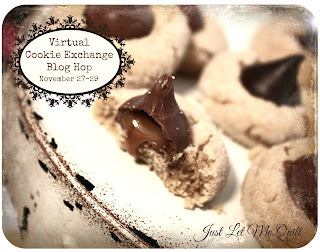 Great blog hop, will try out some recipes for Christmas! What a lovely post! I have enjoyed this hop with all the fun and inspriation and recipes! Thank you! Carol -- I love this post-- all of your pictures are wonderful. Thanks so much for hosting the blog hop. And thanks for the cookie recipe. I will try it for sure as my family loves the similar one without all the good ingredients that one might find in a grocery store! BTW, I can relate to Christmas morning waiting -- as we lived on a dairy farm, we had to wait until the cows were milked before we could open gifts. I guess I still turned out alright . Thank you so much for all the work you put into these blog hops. Thanks for organizing the blog hop. I have enjoyed reading all the blogs. You have a beautiful family. Your cookies sound delicious and I love your grinch quilt. Thank you for sharing your recipe and traditions. The cookies look delicious I enjoyed reading your blog this morning. I love the grinch quilt will there be a pattern available? What a great post, Carol! I love all the pictures and your story, and the cookies look awesome (maybe I can talk one of my daughters into making them too...), and the grinch quilt is really neat! I have always had a soft spot for little Max the dog, sweet thing. Thanks for the hop--enjoyed it, as always. This has been such a fun blog hop and I had added to my cookie recipes like crazy!! Luckily I just got a new-to-me freezer so I can fill it with cookies!! I'll be adding your Grinch Ganache Cookies to my list! I'm wondering what yucky stuff was in the recipe? I bet you have a lot of fun on Christmas morning!! Thanks for the cookie recipe, and I love your Grinch quilt. Thanks for hosting this great blog hop and Merry Christmas!! What a fun pot Carol and a great hop! Your Grinch quilt is perfect for the season. And wow all those gingerbread houses, how fun Christmas is at your house. I love your sense of family and traditions! I also love your Monkey boys. I look forward to trying out your ganache filled cookies. Your daughter made them look sooooooooo good. So much fun reading this post, seeing your family pictures, all the fun and festivities and that cookie recipe -- yum! Just mention chocolate and I'm there! 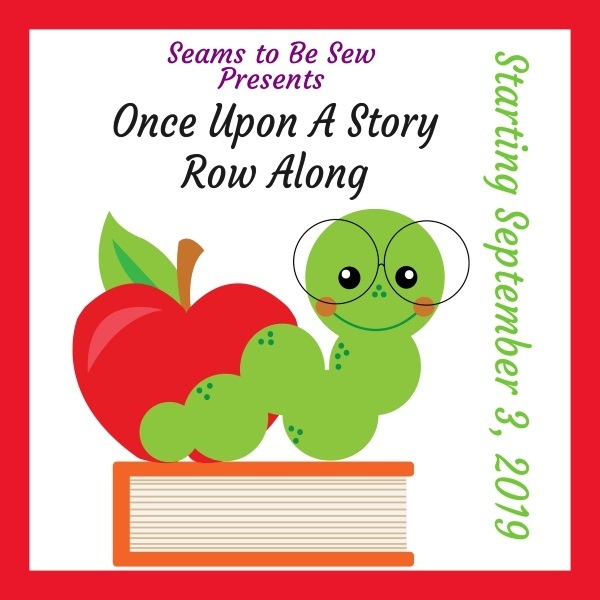 Thanks for hosting this fun blog hop, Carol! Those Grinch cookies look awesome, but Oooooohhhhhh, the puppy Max on the quilt! I die! Max is my FAVORITE! I have no idea where you live, but if you're ever anywhere near Springfield, Massachusetts, there's a Dr. Seuss sculpture garden at the Springfield Museums and there's a bronze of the Grinch and Max. So cute. Bored? HE** NO. What a fun post. I love your pictures as much as I love that Grinch quilt. Your daughter rocks. I'm worn out with your discription of her making the cookies. Thanks for the fun, my friend. Merry Christmas! Love seeing your family photos Carol. Looks like a fun bunch of people to enjoy the holiday with. Have a great holiday season! Virtual cookies are the only kind I can enjoy now, lol!!! Thanks for hosting this event ! Merry Christmas to you and your family ! Carol, your holiday celebrations sound like so much fun! Makes me want to be part of the family ~ wink~ I will have to have my own fun times like those! And the Grinch quilt is adorbs!Thanks for all the holiday sharing Fun! Your cookies look delicious and I love the quilt. Some great recipes this year, Carol. 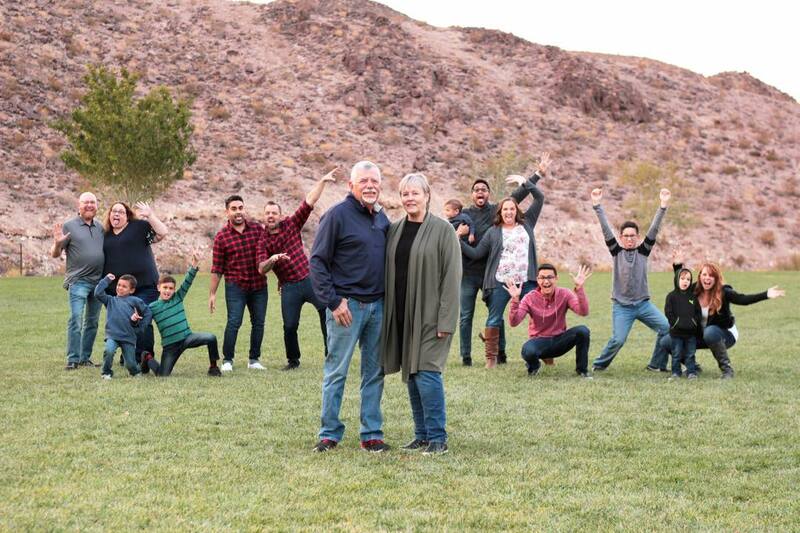 Love the picture of you "normal" family. Made me laugh. 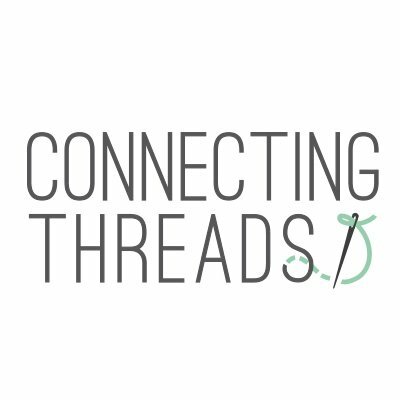 What a SWEET blog hop! So many creative projects...but after reading...I want a giant glass of milk to go with all those cookies!!! Those cookies look and sound awesome! I may have to try these! My hubby has a grinch sweat shirt he wears every Christmas! I need to make that quilt for him - he would love it! Thank you so much for sharing your Christmas with us. I really enjoyed your post. And, thanks for hosting this fun blog hop. This is my first year, but definitely will not be my last! I love seeing your totally normal family!!! LOL!! What adorable photos! Now about those cookies... really, your killing me here. They look fabulous! That daughter of yours...can I borrow her? Where oh where can we find your Grinch pattern? 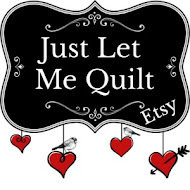 Is he on your Craftsy page? I want him for Christmas! Wishing you and your family a very Merry Christmas! Beautiful family!! Lovely gingerbread house building tradition. I've done that in the past but not every year. I've had the kids and grandkids begging to do it this year. I just might have to. Do you bake your house pieces or buy them pre-made? I've always made ours so it's a long affair. Thanks for all you do to set up this blog hop. Nothing says "get into the Christmas spirit" more than looking at lots of cookie recipes. Carol, I am so glad you waited for me. I have been so busy. Your blog posts always cheer me up. I adore your family, I love the family group photos, that is love. I will make these cookies, and there are a few along the hop that caught my eye. One thing is, everyone's blog has been a joy to visit. I always come to Christmas straggling from behind, I hope to catch up next week. Today is daddy's birthday and we are going to take him to his favorite Italian place.. This week-end I hope to look to this season in a positive light, and not think about worries. Thank you for sharing your delight and gladness. I love seeing pics of your kids, and the monkey boys. Did you use Bobbin as your Max model? She gets that look sometimes. Now I am dying to know what kind of yucky stuff did you not want in your cookies? Loving the virtual cookie exchange! Thank you. I wouldn't have missed a single picture or story! That was fun, and your recipe looks divine. I'll be making these this year, for sure. Yum, your cookies look so elegant and then so grinchy. They look really good. And your quilt is so fun. I loved getting to see more of you and your family. Thank you for sharing with us and organizing this fun cookie hop! Loved seeing pictures of your wonderful family. Monkey boys are little cuties. Thanks for sharing your sweet quilt and cookies. Those cookies do look delicious! Great hop! I'm sure I've gained weight just looking at the cookies! Thanks to all for sharing your recipes with us. Happy Holidays to all!! Sweet and fun photos! The Grinch quilt is fabulous. The cookies look so delicious, I am glad your daughter decided to help you with the recipe. Many thanks to her and you for hosting this wonderful blog hop. Your home sounds like such fun during the Christmas Season...what a fun family.Love the cookies...might have to try them. Thanks for such a fun time with this cookie exchange...there are some yummy yummy stuff out there. Another great hop Carol. Added a few more recipes to my recipe box. Must never be a dull moment at your house with a large family like you have. Merry Christmas! What a fabulous post! I love your Christmas past photos. 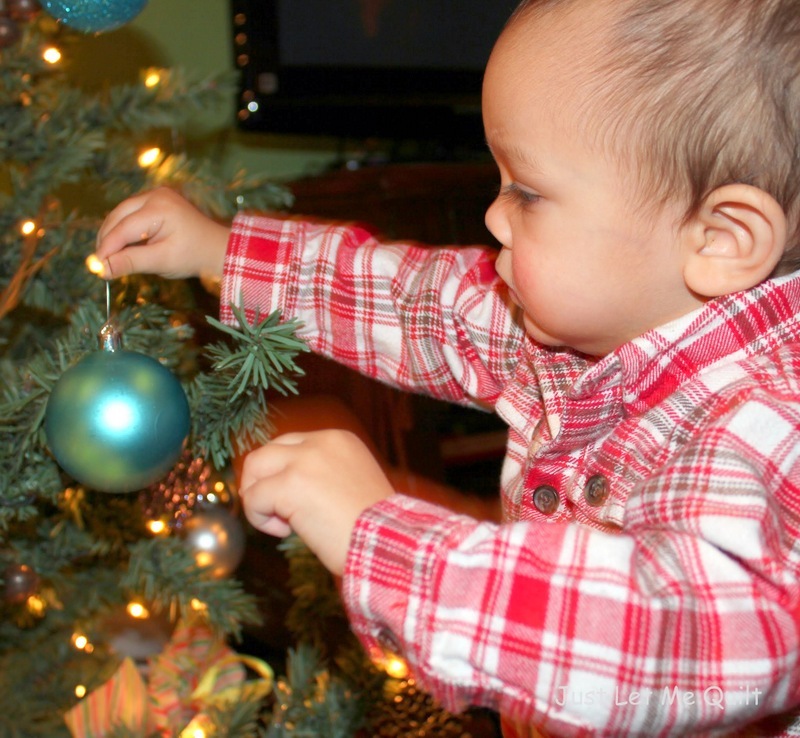 Our traditions get modified as circumstances change, but it's important to HAVE traditions! Your daughter is definitely a keeper and those cookies look wonderful! I'm very impressed with her. The Grinch quilt - oh so much fun! I love the Grinch, too, even at his worst. Those cookies look so yummy. Definitely on my list to try. I love that row of gingerbread houses. Love your holiday traditions! Such a fun post. What fun you have! Love the Grinch quilt and all your gingerbread houses. I am sure my grandsons will like the grinch cookies, anything grinchy is good to them! Thanks so much for hosting the Blog Hop. It's been fun to find all these delicious cookie recipes. Thank you so much for hosting again - always a hit and the bloggers really came thru with A+ s. I gained weight just reading recipes. The addition of the traditions and projects was icing. I was amazed at the number of gingerbread houses!! but you have quite the gang there. The Grinch is an icon now isn't her. This was my first cookie-exchange, and I'm looking forward to do it again next year. I already know what recipe I'll share. Always, your cookie hops are such fun and I always find a few cookie recipes to try each year. It's nice to try new things that are also 'tried and true'. Thanks, Carol. You make the cutest quilts and the Grinch Inspired Christmas Quilt is no exception. any cookie that has the word Ganache in the title must be fabulous!! This was such a fun hop - traditions, cookies and quilts! Love all those gingerbread houses all lined up! What fun! Carol, you are living the dream! With a beautiful, loving family and all of the awesome fun traditions you have each year, I'm jealous! My family runs on the dysfunctional side, but we still have so many blessings to be thankful for. Thanks for sharing all the great photos! What a fabulous post. Please don’t bother putting me in the draw...I just wanted to catch up with you. Love seeing your ‘normal’ family..such a cute picture! Love seeing all the family pics...how exciting to see the monkey boys as they grow older. And those gingerbread houses! Awesome! Your grinch quilt is amazing...you have mastered appliqué and design. Wow! All the cookies look and sound delicious. There are several that I will try for sure. I didn't know there was a Pinterest page for each year, so I'm off to check them out! PS, I've been wanting a Stash n Store for a while now!! Your cookies are delicious! I had to try them. I love your "normal" family photo and reading about your Christmas traditions. Yes, you raised a wonderful daughter. :-) Merry Christmas to you!